Because decking the halls is one of my favorite pastimes, it’s so easy for me to get carried away with holiday decor. So how do I keep my home from looking like a tacky Christmas sweater? It’s easier than you think with these simple tips. If your decor’s foundation is grounded by a neutral color, like gray, white, or beige, then integrate an accent color or two. Traditional red and green is easy to find but don’t be afraid to experiment with unique color combinations. One year we revamped our holiday decor by adding turquoise accents! One of my favorite go-to items are bold, brassy stools and side tables. So versatile, they integrate perfectly into your holiday decor. Even better, you don’t have to pack them up when the season is over. If you’re a bonafide brass fan, then also scour your local antique shops and thrift stores for brass bowls and candy dishes. They make festive containers for holding nuts and sweet treats. Fresh greens are perfect for all seasons and nothing says “the holidays are here” like the fragrant aroma of pine. A spritz of water every three days keeps the color vibrant. If you don’t get around to it, don’t worry, your garland will still look great as it dries out. If your home already has an abundance of color, then you’ll need to be more selective. Choose a metallic accent like gold or silver for a foolproof method of getting holiday decor right the first time. Decorating time is cut in half because you know exactly what you’re looking for. Think about it this way, the goal isn’t to add more color. You’re simply adding sparkle which turns any setting into a festive backdrop. Are you a glitzy girl at heart? If so, then treat yourself to an indulgent, hand-beaded stocking. This mixed-metal beauty is ON SALE NOW and makes a lovely holiday gift idea for the divine diva in your life! Don’t we all know a few? It’s not unusual to find faux fur pillows, throws, or rug in a winter setting, but why not try a fur stool or pouf? They create additional seating for guests and make intriguing conversation pieces and luxurious holiday decor. Fur furniture not your thing? 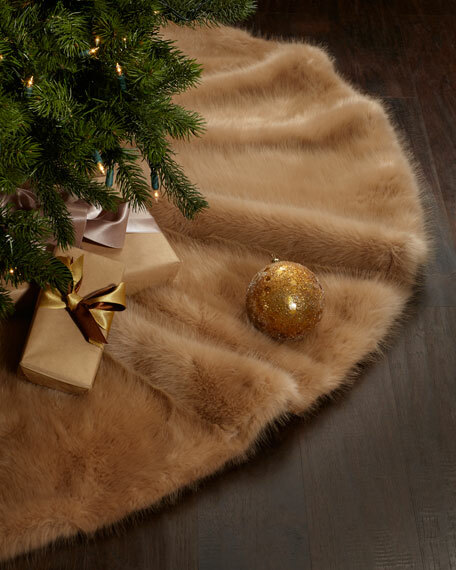 Shake things up with a faux mink Christmas tree skirt.